Do you have a job that requires crane rigging and lifting? We’ve got your crane for hire. We’re The Crane Guys offering crane rental services. So what kind of job are you facing? The Crane Guys has the right crane for hire. Our fleet covers the gamut. For really, really heavy loads, we offer everything from 25 to 265-ton hydraulic cranes. All of these muscle machines are consistently tested and maintained to deliver peak performance. We know things can get rough out there. And we want to be ready. Guess that’s why we can lift most anything. The Crane Guys has handled industrial HVAC systems, portable sound stages, the roof of a college building … even an entire airbus. Most every industry looks to us when a crane for hire is needed. Telecom is a common one. If a cell tower component needs repairing or replacing, we’re on it in a flash. Our fleet of 3 to 40-ton boom trucks provide plenty of lift-muscle for medium-size challenges. Carefully maintained and serviced like our 25 to 265-ton hydraulic cranes, these boom trucks arrive fully-equipped and ready for action. Like our bucket booms. You can count on these ‘cherry pickers’ to provide a safe, efficient lift no matter what the distance. Nobody’s more on target than The Crane Guys when you need a crane for hire. That’s because we ‘live’ every lift long before we arrive. We use the industry’s most sophisticated software to create precise 3D lift plans that put us right in the thick of the action. Each plan provides an advance rendering of the job, including potential hazards and unusual conditions. All variables are compiled and calculated to the finest detail, giving our planners a solid blueprint on which to build a plan of action. Supplied with these detailed pictures, our planners consistently make the right decisions. 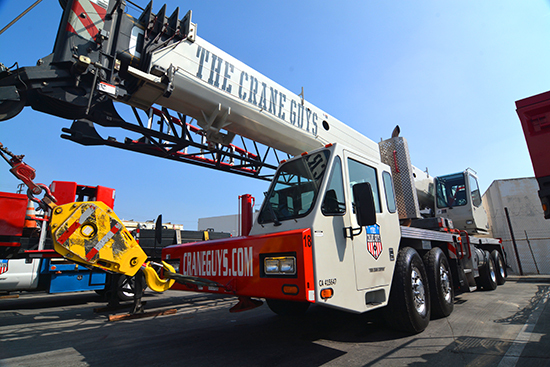 From the very beginning, The Crane Guys has made safety a top priority. All crane and rigging personnel have received rigorous training and have earned the industry’s highest certifications. Moreover, they must strictly adhere to a set of advanced safety protocols. But we’re not taking any chances. So we maintain 5 times the insurance required by the crane rental industry. Our crane rental services are plenty fair to your wallet. In fact, we offer a 5% guarantee — no matter what crane you hire, The Crane Guys will beat any written offer from a competitor by the crane rental industry. 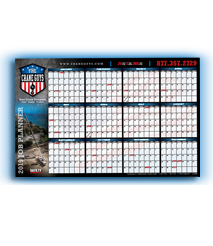 If you’d like to schedule and plan a crane rental with The Crane Guys, or just learn more about our services, please call us at (855) 482-7263 for additional information and answers to all your questions. 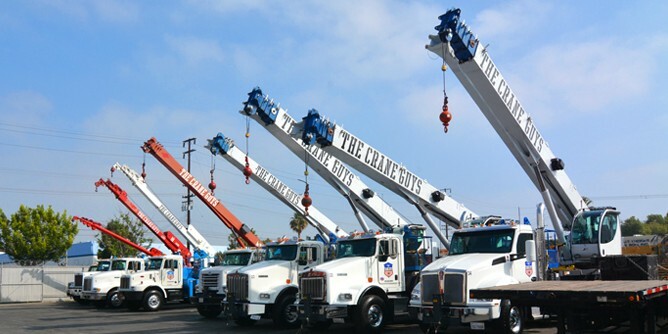 You’ll discover why we’re the go-to service when you need a crane for hire in Los Angeles County, Orange County, Riverside County, San Bernardino County, San Diego County and Ventura County.